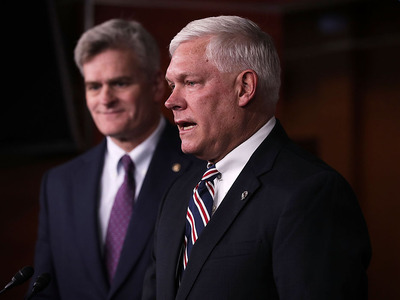 Alex Wong/Getty ImagesTexas Rep. Pete Sessions participate in a news conference May 23, 2016 on Capitol Hill in Washington, DC. The chairman of the House Rules Committee said Sunday that Democrats who staged an unprecedented 25-hour sit-in demanding a vote on gun-control legislation should be “held accountable” for their actions. “There was a complete lack of [respect] and I believe what they did is not only wrong but that they should be held accountable through an ethics process for that,” Texas Rep. Pete Sessions told WFAA-TV. Last Wednesday, House Democrats, led by civil-rights icon Rep. John Lewis, said they would not vacate the lower-chamber until gun-control legislation was brought up for a vote. When House Speaker Paul Ryan attempted to move on with other business, the Democrats shouted “no bill, no break” at him. Eventually they ended their sit-in, despite no legislation ever coming to the floor. Last week, the Republican congressman used similar rhetoric. He called the protest a “stunt” and said Democrats were using “tyrannical antics” to score political points.